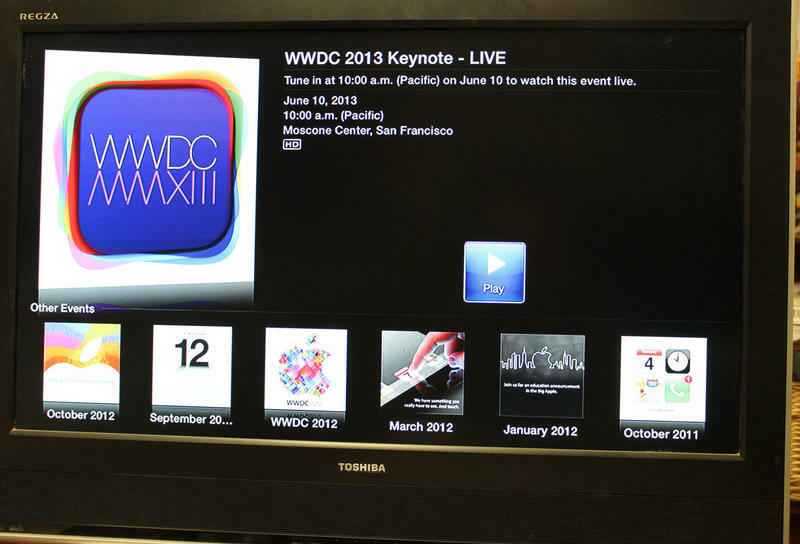 The WWDC 2013 Keynote will appear on Apple TV devices today, but no word as of yet where else you may be able to find it. With just hours to go before the WWDC 2013 Keynote kicks off today, Apple has quietly updated the Apple Events section of the Apple TV devices with a link to the live stream. Apple's history with live streaming events is spotty at best, and it looked like this was going to be another missed opportunity for the company. No word as of yet if this will also appear on iOS devices or Mac computers, but a quick spot check does not show it appearing anywhere else quite yet. The event is due to kick off at 10:00 a.m. Pacific/1:00 p.m. Eastern, so you may want to check your devices closer to the time. If you don't have access to the live stream, we will be in attendance at the event you can follow along on our WWDC 2013 liveblog. Update: Literally minutes after we published this story Apple updated its website with a link to the live stream. You can now watch the WWDC 2013 Keynote live stream via your various Apple devices.